Asgard RR. Car Shop - "Boxcar Heaven!" The biggest part of a railroad's work is moving freight. That is how railroads make their money. 99% of all trains are freight. Freight means products that are being shipped. The railroad is the cheapest way to send freight long distances. Railroads carry most of the coal, steel, grain, concrete and produce in our country. They also ship automobiles and trucks, cable, generators, heavy machinery, gasoline, oil, chemicals, livestock and food. 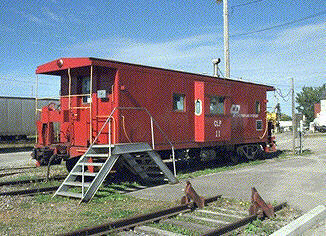 The caboose is a moving office, break room and even sleeping quarters for train crews. 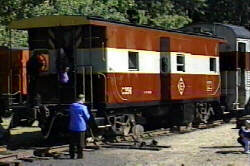 The caboose has a stove for heating and cooking, a desk for the conductor and bunk beds for long trips. 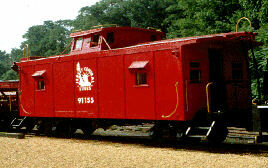 Most cabooses are bright red, so they can be seen from far away. Each railroad has their own special way of decorating cabooses. The small cupola on top of the caboose lets crews look over the top of the train. In the old days, train men could walk along walkways on top of freight cars. 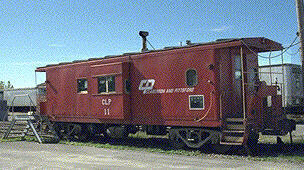 They do not do that any more, so some cabooses do not have a cuploa on top. Instead, they have them on the side so the conductor can look along the length of the train from the side. Boxcars are used to haul freight that must be protected from weather. Most boxcar freight is in boxes! There are many kinds of boxcars. some are extra long and some are extra high. Each railroad paint their boxcars the way they like, but most boxcars are a dark maroon which railroaders call "boxcar red." Hopper cars carry loose freight, such as coal, gravel, sand, concrete and grain. Products that are not harmed by weather are carried in open hoppers. Other products, like wheat, corn and concrete, are shipped in covered hoppers. The hoppers are loaded from the top. To empty them, the hoppers are pushed onto a trestle that has a gap between the rails. Below it is a bin. The hatched on the bottom of the hopper are opened, and everything falls to the bin udner the trestle! Gondolas are low cars used to carry freight which is not harmed by weather. They carry everything from scrap metal to blocks to pipes and wood. Sometimes the end of a gondola is cut off, ao that the boom of a crane car can rest in it. Flat cars carry large things that do not need to be protected from weather. Everything from trucks to pulpwood to boats can be put on flat cars. Tank cars carry liquids of all kinds. Tank cars carry gasoline, oil, chemicals, and liquid foods. Most tank cars have one dome on top. Some older ones have three domes! Refrigerator cars have insulation and a regfrigerator to keep the inside cold. They are used to ship things which will spoil if not kept cold. Products the might spoil are called "perishables." The old refrigerator cars used ice, which was poured into bunkers on the sides of the car. They had a hatch on each side of the roof. The car would be pulled inder a chute from an ice plant - a place where ice was made - and then the bunkers were filled. Cars might have to be refilled with ice every few hours! Today, machines do the cooling, so refrigerated cars can stay cold for days. In railroad slang, refrigerator carsare called "reefers." A pecial type of "reefer" was the milk car. The first milk cars were refrigerated boxcars. Molk cans were hauled into the cars. Later, old boxcars and reffers were lined inside with special glass. Milk was pumped into the cars, where it stayed at 39 degrees. The old milk cars were usually painted green. 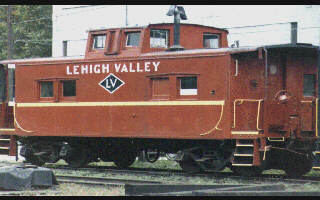 Railroads and dairies owned fleets of these cars. They would stop at each station along the way to pick up milk, and then brought it into the city. The slang term "milk run," which means an easy journey, came from the milk trains. In the 1950s, dairies used trucks. There were fewer milk trains. Today, railroads do not do milk runs any more.